This highly practical and user-friendly guide provides you with a thorough analysis of the 2014 London Court of International Arbitration (LCIA) Rules. You’ll find a comprehensive explanation of the basic principles governing LCIA arbitration, along with an in-depth analysis of complex issues that may arise in the course of LCIA proceedings. The LCIA is the longest-established of all the major arbitral institutions, and so the publication of their new rules is an important event. This book examines the key changes introduced by the 2014 rules and the key reasons for choosing an LCIA arbitration, and takes you through the stages of drafting an LCIA arbitration agreement. It examines the request for arbitration, the response, and the Tribunal’s jurisdiction. It explains the rule about communications, and how the arbitral tribunal is formed. It looks at the challenge, removal and replacement of arbitrators, the language of arbitration, and includes a chapter dedicated to hearings, witnesses and experts. Separate chapters on awards, costs and deposits, confidentiality and limitation of liability will provide practical help to anyone working in this field. You’ll find plenty of useful references to relevant national court judgments, statutory provisions, up-to-date statistics and bibliographical sources on LCIA arbitration. The authors bring together a diverse and complementary outlook on LCIA arbitration, combining academic and practical perspectives, common law and civil law training and practice. Their professional and personal experience as counsel, arbitrator and former LCIA Deputy Registrar gives them a unique and in-depth insight into this important area. Arbitrating under the 2014 LCIA Rules will be essential reading for business executives and corporate counsel working in this area, as well as to practitioners and scholars. Chapter 1 Introduction and the Institution. Chapter 2 Key Changes Introduced by the 2014 Rules. Chapter 3 Key Reasons for Choosing LCIA Arbitration. Chapter 4 Drafting an LCIA Arbitration Agreement. Chapter 8 Rules about Communications. Chapter 9 Formation of the Arbitral Tribunal. Chapter 10 Expedited Formation of the Arbitral Tribunal, Emergency Arbitrators and Expedited Replacement of Arbitrators. Chapter 11 Challenges, Removal and Replacement of Arbitrators. Chapter 12 Seat and Place of Arbitration. Chapter 13 Language of Arbitration. Chapter 14 Conduct of Proceedings and Default Timetable. Chapter 15 Hearings, Witnesses and Experts. Chapter 16 Special Powers of the Tribunal. Chapter 17 Interim and Conservatory Measures. Chapter 19 Costs and Deposits. Chapter 20 Awards and Correction of Awards. Chapter 22 Limitation of Liability. 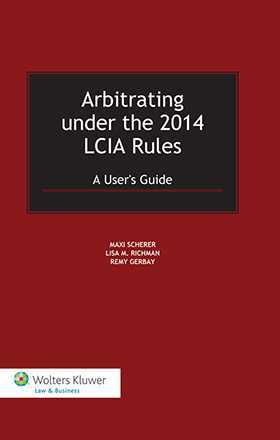 ANNEX I LCIA Arbitration Rules. ANNEX II LCIA Schedule of Arbitration Costs. ANNEX III LCIA Online Forms.